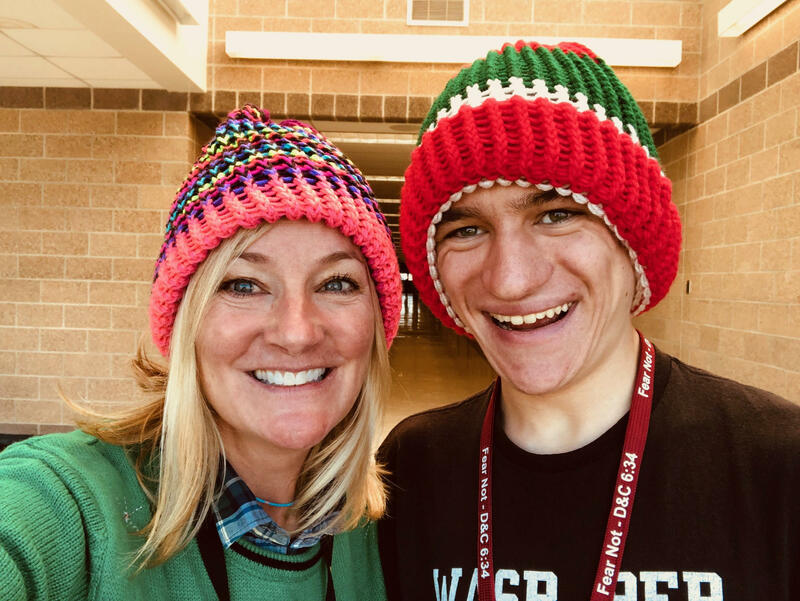 Wasatch High junior Ben Miller, and his teacher Lindsey Jacobson pose in a pair of Ben's hats. A Wasatch High Student with a special talent has turned his skills into a thriving business, thanks to the help of a caring teacher. Ben Miller, a junior at Wasatch High School, is prolific when it comes to crocheting hats. KPCW asked him how many hats he makes a week and when he started making them. Ben has autism, he also has a good friend in his teacher Ms. Lindsey Jacobson. She noticed Ben’s creations and had an idea. Ms. Jacobson said that from there the business took off. Ben says he looks forward to expanding his business. Ben also says he is grateful for Ms. Jacobson’s help. Ms. Jacobson says that she’s also had a good time working with Ben on the hats. Ben also gets help from his younger brother Samuel. He’s made a good amount of money so far. Part of his success stems from his optimistic nature. Crocheting hats has been therapeutic for Ben. Ms. Jacobson also recognizes how important making hats is for Ben. “Kids in special ed have a transition plan and it’s like what are you going to do when you graduate high school? What’s your job going to be? How are you going to make money? There’re so many kids that can’t get a decent paying job because of their disability. He could potentially make this a job. I choke up. I choke up every time I talk about it because it’s just the coolest thing. Ben has one final message to his customers. $20,000 has been awarded to students in the 2018 Lassonde Institute Utah High School Entrepreneur Challenge. Out of 150 innovations submitted, five teams from Park City High School and one from Wasatch High School finished in the top 20. Heber City Police have arrested four people in connection to a series of car thefts. Last week a series of burglaries had Heber Police reminding residents to not leave their keys in their cars. A rash of car thefts have hit not only Heber and Midway but also up into Park City and Summit County. Law Enforcment officials had been able to recover a few of the stolen cars but they had not made any arrests.